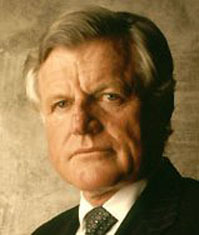 Ted Kennedy held his Senate seat for more than four decades. He authored or argued for legislation that ensured a variety of civil rights, increased the minimum wage in 1981, made access to health care easier for the indigent, and funded Meals on Wheels for fixed-income seniors. His other successes include reducing the voting age from 21 to 18, and Title IX, which gave women's athletics much better funding. Widely held as the "standard-bearer for liberalism", his legacy is that his era was dominated by conservatives (Richard Nixon, Ronald Reagan, George W. Bush) and moderates (Jimmy Carter, George H.W. Bush, and Bill Clinton). Kennedy earned C grades at the private Milton Academy, but was admitted to Harvard as a "legacy" -- his father and older brothers had attended there, so the younger and dimmer Kennedy's admission was virtually assured. While attending, he was expelled twice, once for cheating on a test and once for paying a classmate to cheat for him. While expelled Kennedy enlisted in the Army, but mistakenly signed up for four years instead of two. His father, Joseph P. Kennedy, former U.S. Ambassador to England, pulled the necessary strings to have his enlistment shortened to two years and to ensure that he served in Europe, not Korea, where a war was raging. Kennedy was assigned to Paris, never advanced beyond the rank of Private, and returned to Harvard upon being discharged. While attending law school at the University of Virginia he was cited for reckless driving four times, including once when he was clocked driving 90 miles per hour in a residential neighborhood with his headlights off after dark. Yet his Virginia driver's license was never revoked. He passed the bar exam in 1959, and two years later was appointed an Assistant to the District Attorney in Massachusetts' Suffolk County. In 1962, at age 30 (constitutionally, the minimum age to hold a Senate seat) he ran for the Senate. His timing was perfect -- his brother John had given up the seat to become President, and Kennedy easily won the office. He was re-elected to seven more terms. In 1964, he was seriously injured in a plane crash, and hospitalized for several months. Air transport was not good to the Kennedy clan — his sister Kathleen and nephew "John John" were killed in separate plane crashes. On 19 July 1969, Kennedy attended a party on Chappaquiddick Island in Massachusetts. At about 11:00 PM, he borrowed his chauffeur's keys to his Oldsmobile limousine, and offered to give a ride home to Mary Jo Kopechne, a campaign worker. Leaving the island via an unlit bridge with no guard rail, Kennedy steered the car off the bridge and flipped it into Poucha Pond. He swam to shore and walked back to the party -- passing several houses and a fire station -- and two friends returned with him to the scene of the accident. According to their later testimony, they told him what he already knew, that he was required by law to immediately report the accident to the authorities. Instead Kennedy made his way to his hotel, called his lawyer, and went to sleep. Kennedy called the police the next morning. By then the wreck had already been discovered. Before dying, Kopechne had scratched at the upholstered floor above her head in the upside-down car. The Kennedy family began pulling strings, ensuring that any inquiry would be contained. Her corpse was whisked out-of-state to her family, before an autopsy could be conducted. Further details are uncertain, but after the accident Kennedy said he repeatedly dove under the water trying to rescue Kopechne, and he didn't call police because he was in a state of shock. In versions not so kind, it is widely assumed Kennedy was drunk, that he was having an affair with Kopechne, and/or that he held off calling police in hopes that his family could fix the problem overnight. After the accident, Kennedy's political enemies referred to him as the distinguished Senator from Chappaquiddick, or worse. He pled guilty to leaving the scene of an accident, and was given a suspended sentence of two months. Kopechne's family received a small payout from the Kennedy's insurance policy, and never sued. There was later an effort to have her body exhumed and autopsied, but her family successfully fought against this in court, and Kennedy's family paid their attorney's bills. In 1973, at the height of Nixon's Watergate scandal, Kennedy thundered from the Senate floor, "Do we operate under a system of equal justice under law? Or is there one system for the average citizen and another for the high and mighty?" In 1980, Kennedy challenged Carter, his own party's sitting President, for the Democratic nomination. Kennedy's bid was hampered by questions of Chappaquiddick and by an interview with CBS Newsman Roger Mudd, who asked the straightforward question, "Why do you want to be President?" Kennedy couldn't come up with a straightforward answer. Carter was nominated for re-election, but the party's divisions, largely fueled by Kennedy, ensured victory for Ronald Reagan's campaign and agenda. In a late-1980s media profile, Kennedy was succinctly described as someone who "grew to manhood without learning to be an adult". He was rumored to have had several affairs while married to his first wife, and was often been seen in public while thoroughly tanked and/or behaving obnoxiously. In 1987 he was caught in flagrante delicto with an unidentified woman on the floor of a restaurant. His public image after the early 1990s and during his second marriage was more dignified and restrained. In 1994, Kennedy became the first member of Congress to have an official website. In 2001, Kennedy worked with President Bush to enact the No Child Left Behind Act. He later complained publicly that he had been hoodwinked, because the legislation did not include funding to pay for its requirements. Kennedy voted against the Iraq war, and in 2003 said of it: "There was no imminent threat. This was made up in Texas, announced in January to the Republican leadership that war was going to take place and was going to be good politically. This whole thing was a fraud." In 2004, Tom Ridge's Department of Homeland Security put Kennedy's name on the secret national "no-fly list", and he was barred from a shuttle flight from Washington to Boston. After a flurry of phone calls to Ridge's office, Kennedy's problem was described as "a clerical error", and solved within a few days. He was uncle to Maria Shriver and, by marriage, Arnold Schwarzenegger.